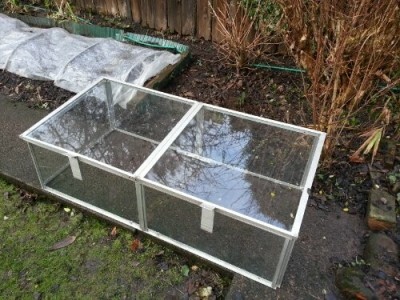 Something that has been on my list of things to get around to one day has been the re-glazing of the cold frame. This is an existing cold frame which had problems right from the start when I got it a few years ago – I broke a couple of the panes just putting it together! 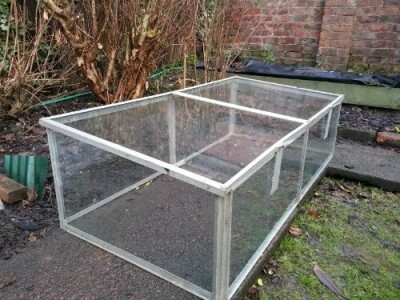 At the time I decided to use perspex so that my clumsy repair attempts would end in the loss of more glass or may be worse a couple of fingers! This approach worked fairly well until it became clear that it wasn’t the best way to do it when the perspex sagged a bit on the top. However by that point I’d lost the will to live and didn’t need it so much anyway because the weather had warmed up. Now that I have properly re-glazed and reassembled the whole structure it looks as good as new to my untrained eye. I’m sure that this year’s harvest will be noticeably improved as a result – failing that at least some of the earlier plantings will stand a bit more chance of success. A thing of beauty as I’m sure you’ll all agree and I’m just ignoring the fact that this replacement glass probably cost more than a new one! !